I would like to comment on the quality of the editing and the fact that there are so many mistakes. Reading the books is just a minefield of mistakes and non sequiturs. I had enough at the following and I’ve decided to post this here. I will not study anymore using the Wiley books because, frankly, I don’t trust them. Thank god I had already read the official books and I was simply going over the printed Wiley notes for revision but after some of the CAPM/APT errors and this, I’m just not reading anymore. I am nearly universally available so students should always feel comfortable reaching out any way they can. Since this was posted here I will answer here. The exam is coming up and there is a lot of incorrect information this user has added and I want to make sure candidates ignore it. First, the learning objective for kurtosis is an “interpret” one. That means no calculations, that means no formulas but it does mean understanding and intuition. 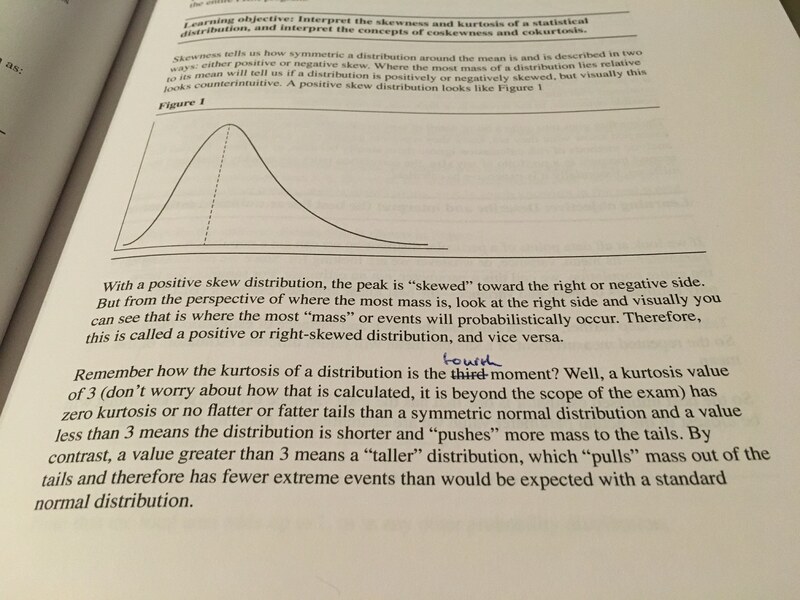 For someone that is less quantitatively inclined (10% of the exam FYI) the concept of kurtosis may be hard to imagine. What I have described and what I do all through part one is to connect the concepts of how expectation, the first moment, duration, (first estimates) and variation, variance, volatility, are second measures. Each new “measure” gives us more information about how a distribution behaves. Yes, kurtosis is actually the fourth moment but it is a description of how the 3rd moment, skewness, behaves just like the variance (second moment) tells us changes or deviations from the expectation(first moment). This is the level of understanding I think you should have around these topics and that is why I present it this way. I will fix one thing and say “kurtosis is a description” of the 3rd moment. But again, what does that mean? The whole intent of this section is to connect dots, not to tell you which moment kurtosis happens to be. A kurtosis of exactly 3 is, in fact a normal distribution. What does kurtosis different than 3 mean? How is that mass pushed around in the distribution? Those are the questions I answer here and that is exactly what, I think, GARP wants you to know. Also for my students the calculation is literally beyond the scope of the exam because there are no calculation learning objectives associated with Kurtosis. That is the whole point of efficient learning: focus on what GARP asks, not what is in the whole chapter of assigned readings. I work in portfolio measurement and i think it’s profoundly confusing wrong to interpret kurtosis in terms of skew; what is even the math justification. A distribution with heavy tails can have left or right (or zero) skew, so what is even the use of trying to interpret thusly. If I give you the skew, you can’t know the kurtosis. Or vice-versa. This is why its not always a good idea to skip the math. Kurtosis is a measure of tail density and this is the interpretation that matters from a risk perspective. The description in the screenshot says “a value greater than 3 means a taller distribution (typical but not always true) and therefore has fewer extreme events.” This statement is false. In my department, we can calculate kurtosis (it’s not really much harder than calculation variance), when you know how to calculate kurtosis you are less likely to make crazy interpretation statments, in my opinion. If it’s wrong, it doesn’t help that it’s efficient!